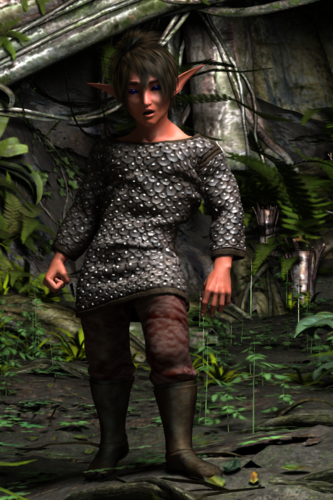 Here's a couple renders of my usual RPG character. He's an Elf Paladin/Wood Elf Warrior I've played in EverQuest and EQ Online Adventures, but I've used him in most RPGs and MMOs. First is a portrait for his EQPlayers page. 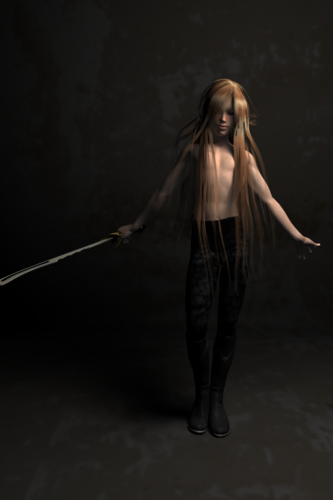 The second was a test render I did while working on HSS settings for him which I decided to try painting in his hair. I'm pretty happy with this one as I built the gun from scratch using Mock's The Gun set of props; it's the NE-600 Pulse Laser from RIFTS (LINK). 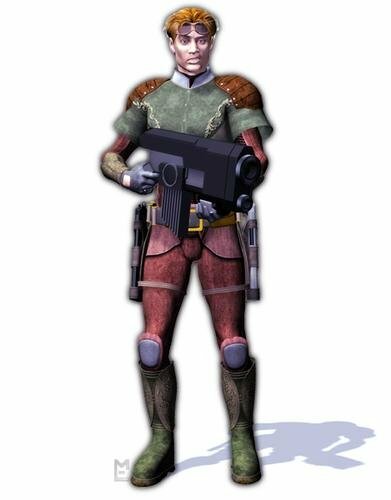 This is a Galctic Tracer (bounty hunter) from the Phase World setting for RIFTS. Art (not final) from one of the Paper Miniatures that I'll be doing after I'm done with the fantasy sets. 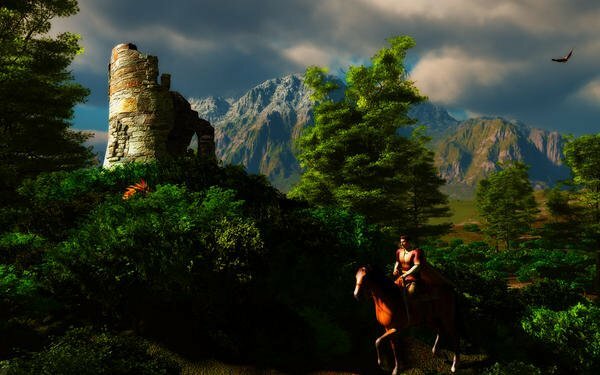 Latest scene "Noble Rider Tower"
the tower is from RDNA "Ancient Ruins castle creator"
The beauty and pleasure of a ride with a noble steed is not to be missed. I remember that one from before, beautiful scene..
A friend commissioned me to do some character portraits for his RIFTS group's character sheets. 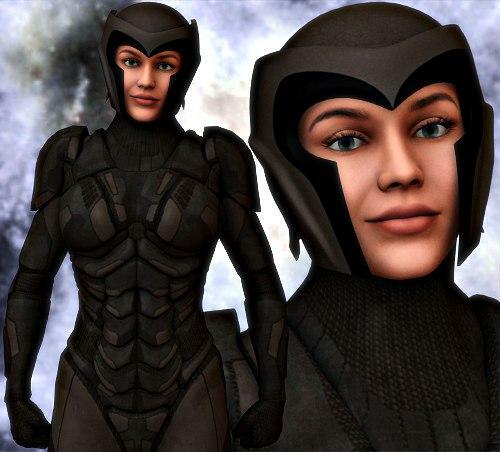 The payment was enough to finally get Lyyra's Lycantropos Bodysuit, which will come in handy for my paper minis project, as there's an entire Roman-esque empire of Wolfen in the Palladium Fantasy world. Anywho, the commission. 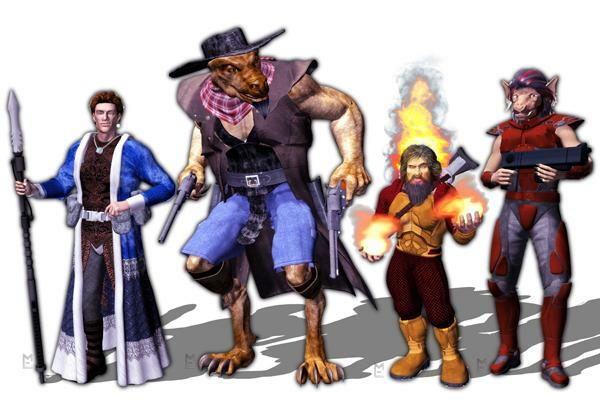 From left to right: a human Air-Warlock, a Grackle-Tooth Gunslinger, a Dwarf Burster (super-pyrokinetic), and a Simvan Monster Rider. Models are M3, Lycanthropos, Freak3 and M4. I put them all together in this group shot so the players could see the size disparity between their characters, lol. 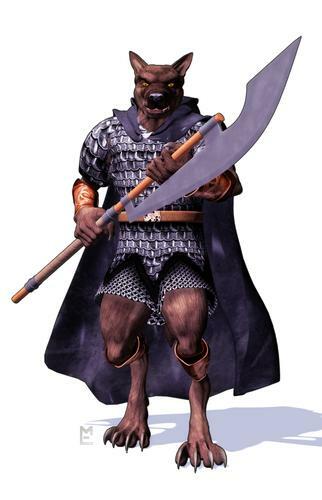 Here's a Wolfen Mercenary; Miniature art for the Tombs of Gersidi, one of Baron Marquest's personal guard. Wolfen average about 10 feet tall. Opps, forgot this one. 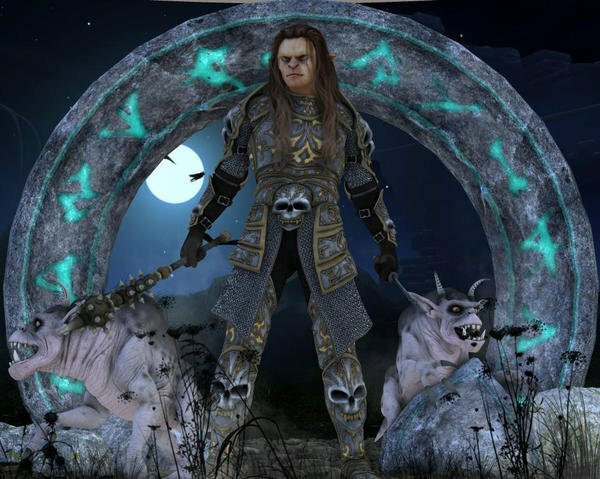 This is Jaderail, my AD&D character as done with DS4.5 and Genesis. 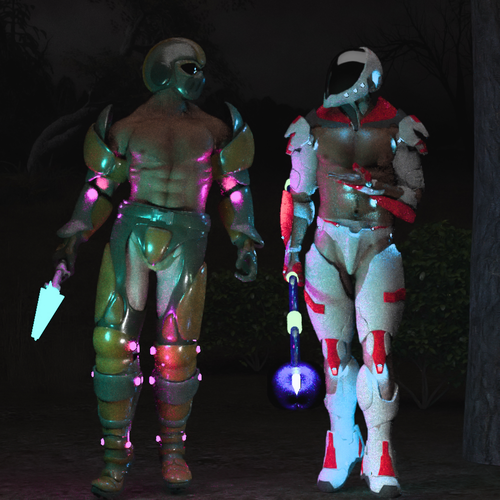 Here are two Cyber-Knight characters from the Rifts main book and Coalition Wars 04: Cyber-Knights that I like to play. 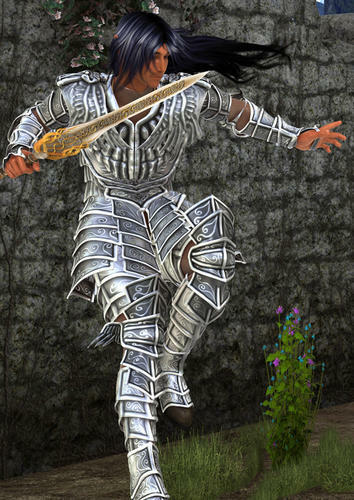 Somehow Jaderail's character makes me think of Elric, albino prince of the dying kingdom of Melnibone. RPGs are wonderful things. They really ought to rank among humankind's greatest inventions. :-) They're not like reading a normal book, because your role is now active and not passive -- which entices you all the more to enter the world of the story. Perhaps one day the RPG will be recognized as a legitimate art form! I also love all those dice created for RPGs. They're like little gems and there's such a wide variety of them. Check out this site for example. Haven't specially rendered any characters for any games but I suppose I might use these two in some future game I decide to join. They're nothing terribly original, but all the same I hope you fellas will see some merit in this pic. 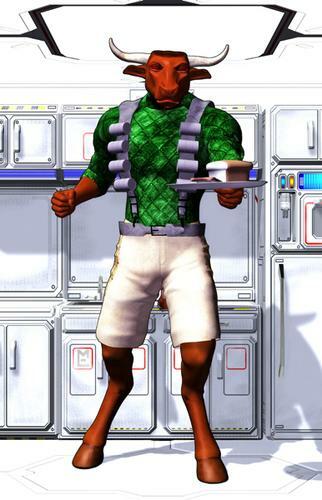 Oh gosh, I got into 3D art to make pictures of my characters, using lightwave on the commodore amiga with the video toaster. I still use it for that today. 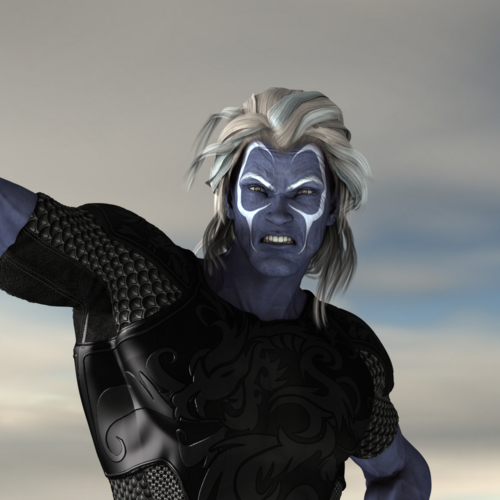 So here are some recent character renders. Quilt who is my Tiefling who has some dwarf blood in him. Then there is Sparrow, my human bard (shown without a shirt in this particular scene...) For that matter, even my Avatar picture here is a closeup of Boojum, my character in the Fantasy Hero game I'm in online! 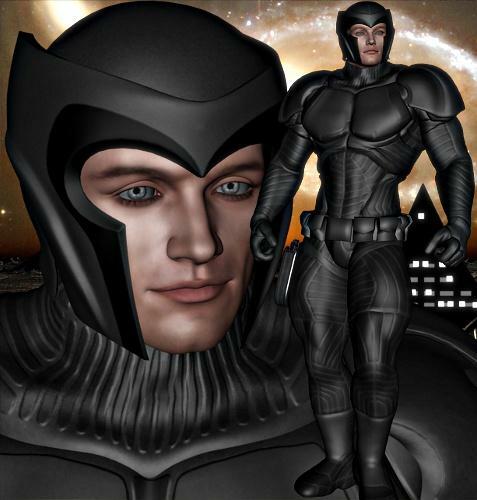 Your second cyber-knight seemed a bit too 'unfeminine' to me, by the way. Then again, what do you expect, she's a cyber-knight! Decided to try my hand at re-creating Alpha Prime from Century Station, a source book in the table-top RPG called Heroes Unlimited. 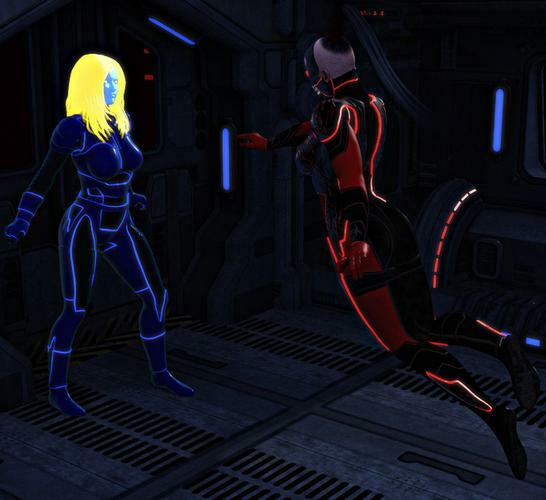 The villian floating towards her is my own creation. I call her Nemesis. I like it! If you have any of Jepe's SpecialZ, you can probably get the hair and hands dead on to the Zeleznik image.. I usually end up adding his stuff in post-work myself.. 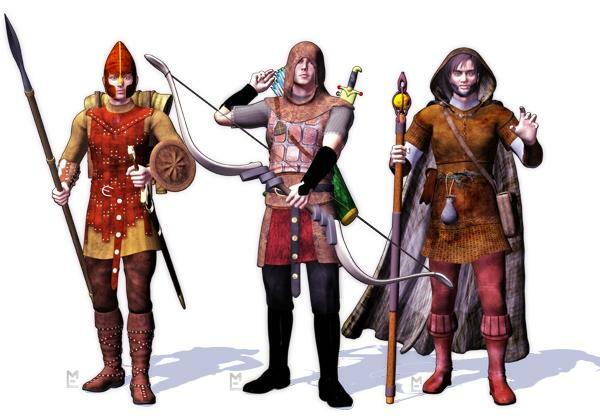 I've been toying with running a Palladium Fantasy game with what few 'friends' I have in the near future, and when I cleaned up my office for the first time in over a year, I found my 'Quick-Gen' character sheets for Solder, Longbowman and Psi-Mystic. Since I plan to use Book II: The Old Ones extensively (it has over 50 different Cities, Towns and Forts described and mapped in the Timiro Kingdom), I decided to do some standard images for the Timiro Militiary.. I haven't finished the Psi-Mystic, instead including a full-on Wizard that serves the military, as I'll probably have the time to help my most experienced player make that character before the rest get together. 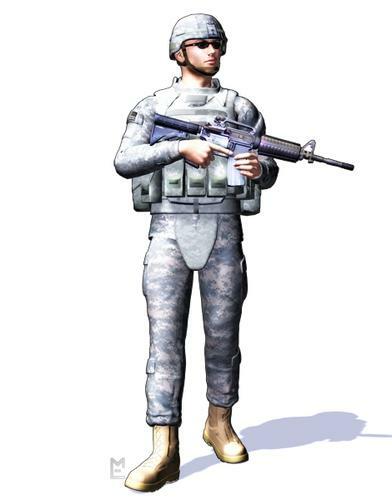 I've been sitting on this cool US Army outfit for M4 for some time, so I thought I'd try my hand at putting together some contemporary military Paper Miniatures.. It needs work, but think I'll get the rest of the accessories and do a set..
Nice! A little washed out / over lit, but overall not bad. Thanks. The lighting is deliberate, as it's designed to be reduced to 1.15 inches for a paper miniature. I do a front and back render and lay them out 27 minis to a page.. same with the three fantasy one's above. Threw this together yesterday; it's actually a portion of Old Timiro, based on the layout given in a map in Palladium Fantasy RPG® Book II: The Old Ones. The building on the left is item 69: "Tavern: Cheap beer, ale and women." On the map there was a wide open space in front of it, so I decided it was a good spot for a market. Took over an hour to render as is, so to add the necessary people will probably take another day or two of work... don't know if I have that in me..
Good job, Madmanmike, on all your renders. Yes, I wouldn't even have the patient for an hours worth of a render. That village looks good. PWCatch? No idea what that is. I use D|S 2.3, the most advanced version that will work on my computer. 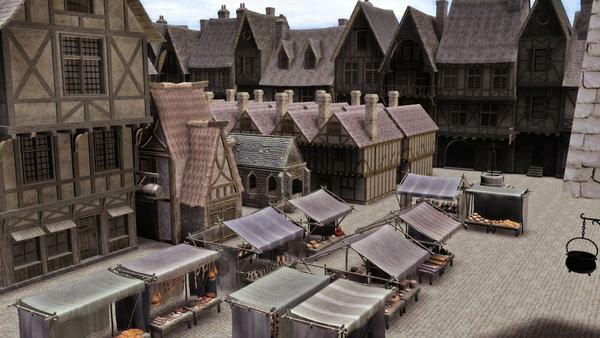 I've actually spent most of the time since I did that render using Poser 6 to hack the Medieval Town kit by George279 (used for the smaller buildings in the middle) to make the interior usable. Well nuts...PwCatch only works for DS 4 (I think for DS 3 as well, not sure). 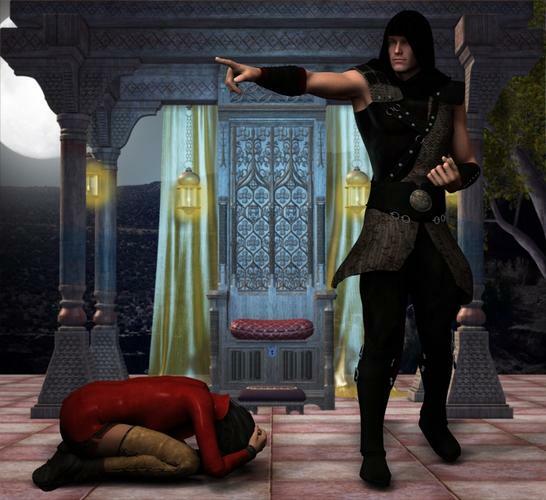 Just to give you an idea of what PwCatch can do though, here's a scene I rendered with a throne backdrop. See those shadows under the figures? That's actually a primitive plane I created as the floor. PwCatch creates the illusion of backdrops being part of the full scene. Interesting. In my experience if you make something invisible, the program renders as if it's not in the document, so I can render part of an image, leave the camera where it is, make that part invisible and another part visible, render that, etc, until it's done. Then it's just a matter of layering it in Photoshop, which I always do as part of my post-work anyway.. If you turn off all the lights, whatever is in your scene will render as all black on white background; In PS you can just select all white and use that to make a mask for that item so you can process it. Mr. Minitour sir, there is a hair in my food! Did I said hair? I meant I LOVE this food, thank you!